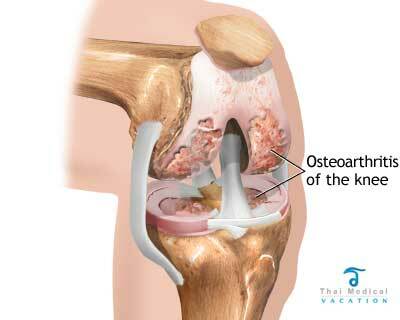 Is severe knee or joint pain interfering with your daily life? 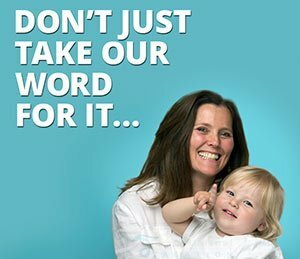 Looking for a simple affordable solution to end the pain? 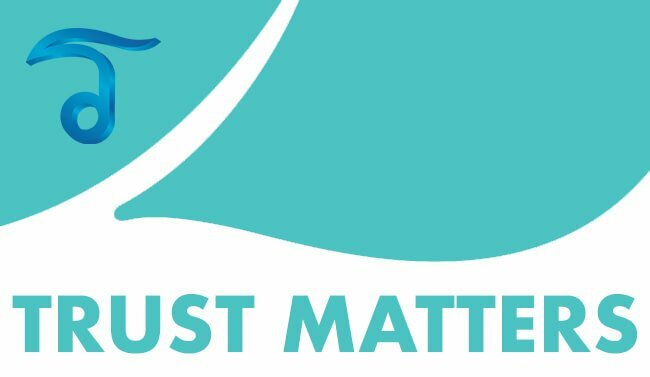 UPDATED April 04, 2018 – Then understanding your options for having guided knee replacement surgery in Thailand will be the first step towards your solution and recovery to enjoy a pain-free life again. Over the past 15 years, thousands of men and women have come to Bangkok or Phuket to have high quality & affordable artificial knee surgery or found less invasive less invasive non-surgical alternatives like orthopedic stem cell therapy with PRP therapy. 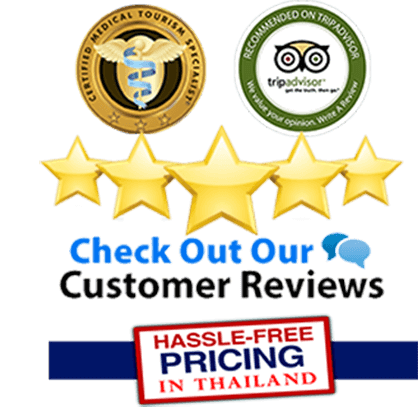 Orthopedic Medical Tours can help you eliminate your pain with a short surgical holiday to Thailand. 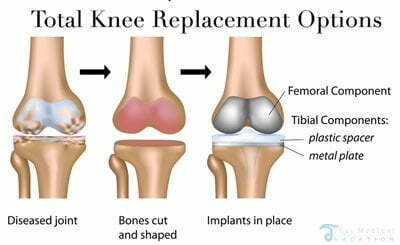 TKR is a surgical intervention in which specific parts of an arthritic,diseased or damaged joint (a knee or hip joint replacement) is surgically removed and replaced with a and artificial prosthesis joint made metal,polyethylene or Titanium. The replacement joints are created to mimic a healthy knee joint. The new artificial joints are typically anchored into place using micro-screws and bone cement. In some applications and patient needs it is possible to cover the joints with a porous coating allowing bone tissue to grow into it naturally. Uni-compartmental knee replacement – Unicompartmental Knee replacement arthroplasty entails replacing 1 or each of the medial and lateral compartments it’s also generally known as unicondylar knee replacement or patellofemoral knee replacement. Bicompartmental Knee Replacement and Resurfacing – This option is much less invasive than Total Knee Replacement surgery and is primarily for patients who have 2 out of 3 compartments damaged by arthritis or injury. You will be asked to fast (eating and drinking) atleast 8 hours prior to having Knee Replacement Surgery. Take your medicines your physician prescribed with a tiny sip of water only. Move your patella (kneecap) slightly away, then shave the end of your thigh/shin bones to allow for a snug fit with the new prosthesis. The surgeon also makes incisions near the underside of the patella in preparation for a new artificial piece to be attached there. 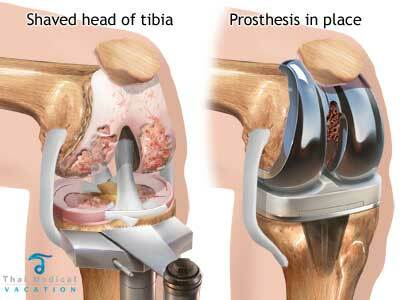 Then permanently fasten the prosthesis directly onto the bone. One component is going to be attached towards the end of one’s thigh bone and also the other component is going to be attached for your shin bone. Each part can then be finally attached near the underside of the kneecaps using a special medical grade cement. Finally our surgeons will repair any damaged tendons and muscles around the new artificial joints and close the cut surgically. You will be asked to wear a medical compression garment on your knee and legs. These garments strengthen blood flow and lessen your risk of acquiring blood clots. Some patients may also get some blood-thinners to help lower any risk of blood clots. Our physician may prescribe some mild pain medications and antibiotics to help control discomfort and to avoid infections. You’ll be encouraged to begin moving and walking as soon as the initial day following surgery. The days following surgery You are going to be assisted getting in and out of your bed onto a chair. In bed you will be encouraged to flex, bend and straighten your legs and ankles to avoid any blood clotting. We also prefer the use of a CPM or continuous passive motion machine in bed. The CPM machine bends your knee for you. CPM machines can help speed your recovery process and also cut down any discomfort, risk of infection or bleeding. Generally, artificial knees have some metal parts, although, some surgeons are making use of some some new distinctive materials, which includes ceramic on ceramic, metal on metal or even ceramic on plastic. NOTE*** For a great animated overview of the surgery watch the following Knee Replacement video or read the the following informative post about knee replacement surgery and the United States Govt Medline. Weak Quads- Weak quadriceps can make it really tough to walk and utilize your knees effectively. Very poor blood circulation within the leg usually from (PAD) peripheral vascular disease. Cease taking ALL drugs that affect regular blood clotting. These involve aspirin, Advil, Motrin, ibuprofen & naproxen along with other drugs. If you’ve diabetes, heart illness and other relevant medical conditions, The Knee surgeon in Thailand may need to speak with your regular physician or orthopedic surgeon in your home. Please tell your physician if you been drinking more than 1 alcoholic drink per day. You will need to stop Smoking before surgery as smoking will dramatically slows down the healing process. Your recovery may well not be as complete if you continue smoking. You may meet or talk with a trained physical therapist “PT” to discover some new workouts prior to surgery and begin practicing with crutches or perhaps a walker. The surgery takes anywhere from 2-4 hours (per-side) and in total will require 3-4 nights at our hospital before you will be discharged to spend the rest of your recovery in your hotel room. ( Included in treatment package ) The follow ups are usually 5-6 days post surgery and you will be able to return home after 14 days. 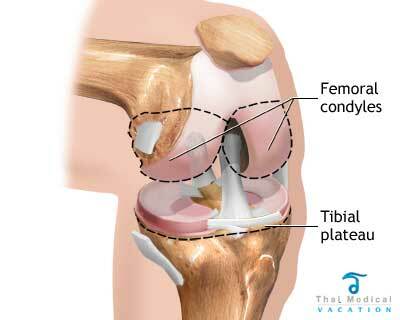 Full recovery for your knee replacement surgery will take about three months to 1 year. 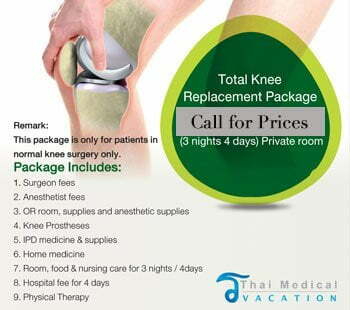 The total price of having artificial knee replacement in Thailand will depend entirely on the patient’s specific needs are and materials requirements. We only offer fixed priced plans and our costs are generally 35-50% less than others but are still performed by one of the best orthopedic surgeons in Thailand who have performed thousands of successful joint replacement surgeries in the past. The outcomes and results can be pretty dramatic as our approved operation helps relieves pain and discomfort for nearly every patient we accept into our treatment program. We use the most modern artificial knee joints that are much more durable than anything from the past and usually last from 12 to 20 years depending on the lifestyle of the patient. 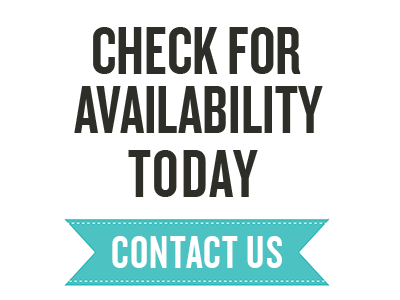 Most artificial knees that we offer today are rated to last over 20 years but may need earlier replacement due to heavier than normal wear and tear. Thai Medical offers patients from across the planet with the most cutting edge integrative regenerative medicine including stem cell therapy for knee arthritis and osteoarthritis utilizing a variety of safe stem cell sources such as Adipose tissue, cord blood, placenta derived mesenchymal stem cells for a 100% non-surgical alternative to knee replacement surgery. Our cell regeneration solutions and PRP therapies can be used for many types of common orthopedic issues. These conditions run the entire spectrum from simple tennis elbow,hand and wrist injuries to degenerative arthritis. The vast majority of common orthopedic ailments however lie somewhere in between those 2 extreme scenarios. Conditions like rotator cuff injury and enthesopathy,spinal trigger points, herniated discs and a whole host of ligamentous/meniscal injuries affecting the knees, ankles, and hips. These are all treatable conditions today using a variety of non-surgical cell transplants utilizing your own mesenchymal cells. 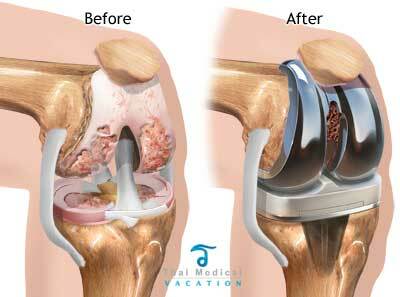 To learn more about Total knee replacement surgery in Thailand or alternatives to TKR surgery please contact us today.